It is about time that FIFA made use of technology to help referees and their linesmen make the right calls in soccer (called football in every other country but the US), especially when there is room for doubt. While there is still much to be done, at least there will be no ambiguity as to whether a ball has crossed the goal line or not, for goal-line technology will help out in that regard. But this particular blog is not about FIFA's use of technology, but the extent to which some individuals (who apparently do not like me - my enemies) will go in using computer technology to get me into trouble. Recently, someone pretending to be me wrote something about my backing Team USA in the FIFA World Cup 2014. Now, some of you already know that I made it clear on Facebook that I was backing Brazil. 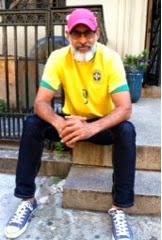 I even produced a photo of me wearing a Brazilian jersey as proof of my support for Team Brazil. And of course one would not be so stupid to back any other team, especially if one's girlfriend were Brazilian. And I swore to her that Brazil had my undying support. Like I often say, I might not be smart, but it am not stoopid (I stole that quote from my friend, Julius, actually.). Now, would you believe it?! 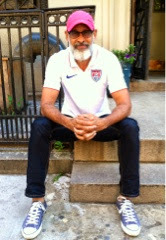 Someone has posted a photo of me wearing a USA jersey, sending me into damage control vis a vis my girlfriend. It is quite clear that the image of me wearing the USA jersey was Photoshopped. Any stoopid person can see that. But obvious fact aside, I have the proof. The original photo is the one with me wearing the Brazilian jersey. The photo of me wearing the USA jersey is not authentic; it was manipulated using PhotoShop technology - a total misuse of technology. Look closely at the two photos and tell me whether the one with me wearing the USA jersey is not an absolute fake. Go U.... (Oops!!). Go Brazil! Phew. That was close.